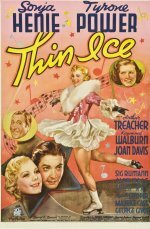 This lightweight trifle stretches Norwegian skating star Sonja Henie's acting ability more than a little, as she plays an ice-skating coach who falls in love with a prince the dashingly-cast Tyrone Power. His sly, knowing performance suggests that the plot is not exactly coincidental - in the heady days of the romance between Edward VIII and divorcee Mrs Simpson. For this opus, 20th Century-Fox constructed a special camera rig to follow Henie's movements on the ice, but it could be argued that the expense was hardly justified, since the real highlight is not the dimpled skater but the wonderfully raucous comedienne Joan Davis, best-remembered over here for her TV series I Married Joan, performing the arch ballad I'm Olga from the Volga.